#1 Uzbek Palace starts the review with a few handicaps. First, it’s located in the middle of nowhere (at least from a Manhattanite’s point of view), at the northern end of the Sheepshead Bay neighborhood — so much so that most web sites aren’t sure whether it should be considered part of Sheepshead Bay, Midwood, or even Gravesend. Then, you have to admit it has a ridiculous name. “Palace” already sounds grandiloquent for a nondescript storefront leading to a railroad dining room, but the “#1” is really over the top. Finally, there’s the slightly schizophrenic cuisine claim: Is it a Turkish, an Uzbek, or an Oriental restaurant? But we at Food Perestroika do not judge a book by its cover, and once again put our scruples aside in order to bring you the truth. I’ll let you go to the web site to admire the indoor pictures of the “palace” which, as with many restaurants in the neighborhood, looks more like a uninhabited house where all the furniture’s been covered with sheets. The dishes clearly show the Uzbek-Turkish duality, with each country getting its own section (Turkish soups, Uzbek soups, Turkish salads, Uzbek salads, and so on). Before you know it, you end up counting 91 items on the menu, not including the beverages. It may not cover every Uzbek dish (no dzhiz-biz, no naryn, no kazy), but you can get your shurpa, manty, samsas, plov, and lagman, plus a ton of kebabs. We started with the grilled eggplant salad, which consisted of eggplants, tomatoes, peppers, parsley, and a bit too much dill. The combination was otherwise well balanced and not too oily. 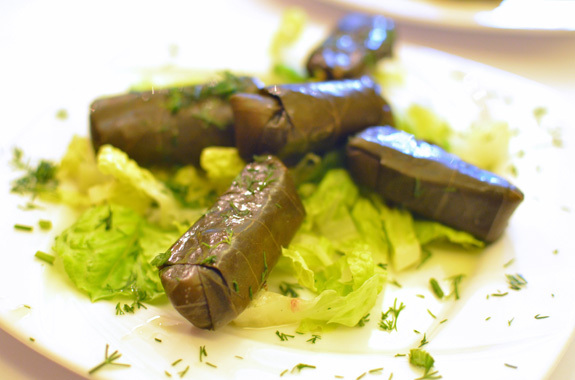 The stuffed grape leaves (which could have been called dolma) were equally simple but good, the vegetarian filling consisting of rice with mint and lemon. 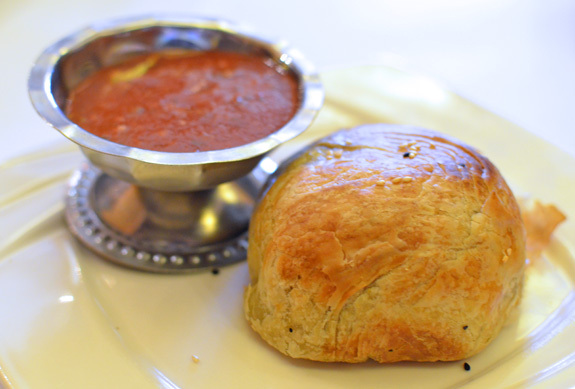 The very good samsa — a classic — was made of lamb meat that was chopped (not ground), cumin, coriander seeds, and onion, in a kind of puff pastry, with a side of ketchup-like sauce. 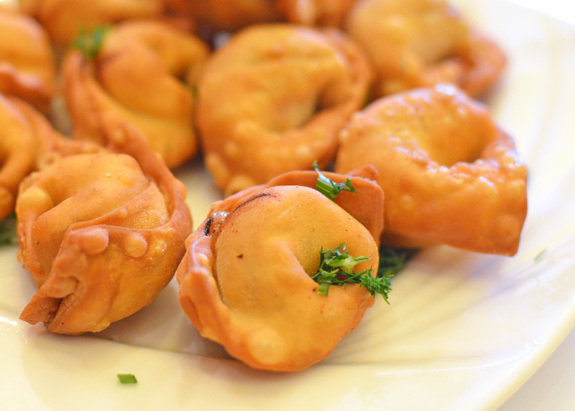 The equally good crispy dumplings — fried tortellini stuffed with a different mixture of finely ground lamb with fewer spices — didn’t come with an Uzbek name, and I don’t remember encountering them during my last trip to Central Asia. 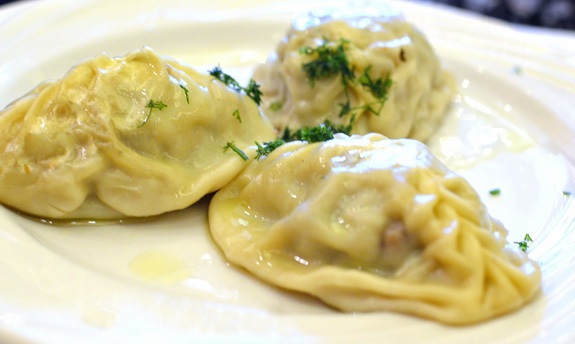 And another successful dumpling: the boiled manty contained the same filling as the samsa, this time wrapped in thin pasta dough. 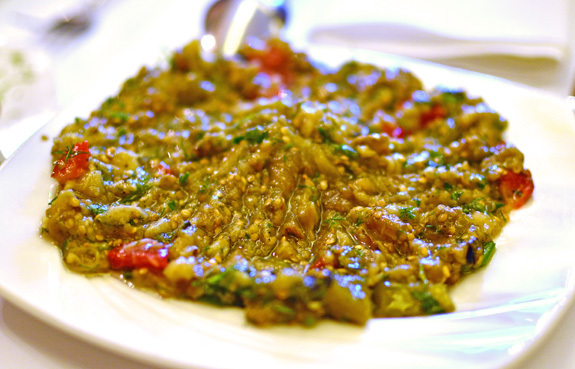 The “Uzbek Palace Special”, as ordered from the list of main courses, could almost serve two people. The two lamb shanks were excellent. Fork tender, well seasoned, not too greasy and yet not dry at all. They came with sliced tomatoes and some okay rice. The rice that accompanied the adana & shish kebab combo didn’t fare much better. Despite coming in two colors, it came with pretty much no flavor. 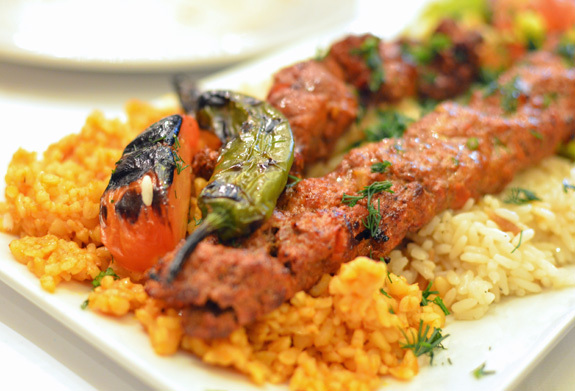 The adana kebab, “ground lamb flavored with fresh red bell pepper lightly seasoned with paprika”, was ever so slightly dry but still good. 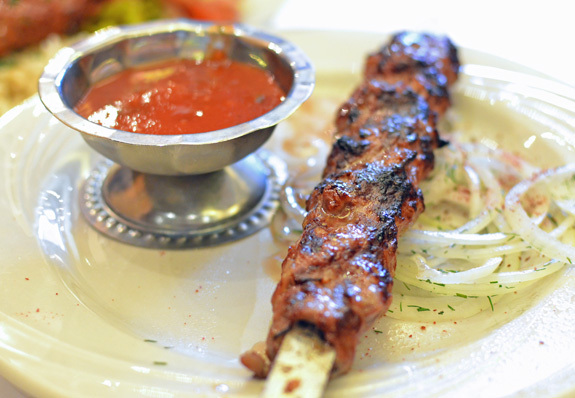 The shish kebab, “spicy marinated baby lamb grilled to delight”, was truly excellent: moist, tender, and not overcooked. 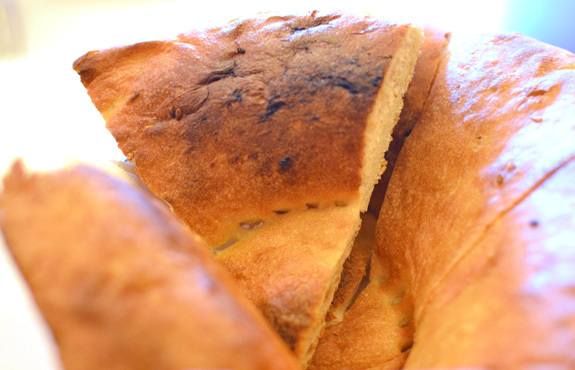 The lyulya-kekab was another winner, juicy and again not overcooked. In fact, I’d say this was one of the best I’ve had in NYC. It came with virtually no garnish, except for a few thin onion slices sprinkled with sumac and herbs, and another bowl of “oriental ketchup”. And of course, we had to try the wedding plov (note to the genius on Yelp who wonders what it means: this is a plov that is traditionally served not for Christmas, not for Easter, but for… weddings). 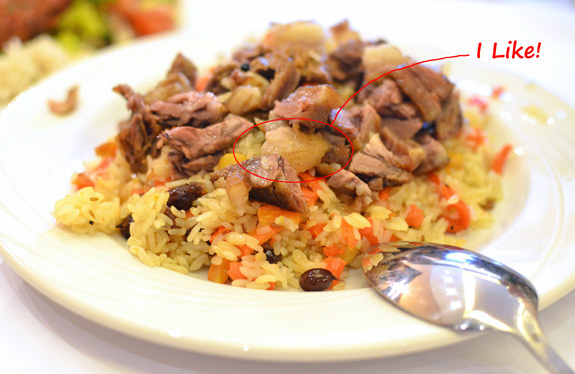 Although it tasted fairly good and featured cubes of lamb fat, it lacked the spices that make a great Uzbek plov (cumin and coriander seeds in particular), whether they were present in too small quantities or not there at all. Otherwise, the lamb was tender. This rendition also contained currants and chickpeas. As so often happens, we didn’t save room for desserts, but this time we decided to take a couple to go. 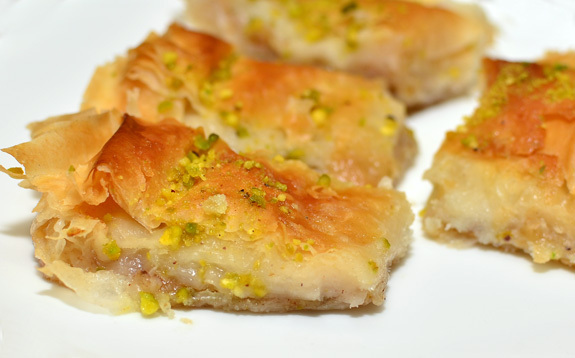 The baklava was prepared in the Turkish style with pistachio and phyllo, but it was rather soft and would have benefited from more honey syrup. The restaurant is BYOB, but as far as beverages go they do have tarkhun, some very nice sour cherry juice, and uzbek tea (I imagine they have more capitalist beverages, too). Overall, this was a very pleasant experience. 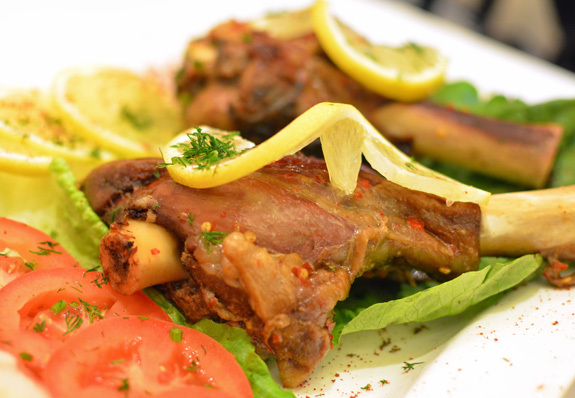 Uzbek food is rather rustic, and you really do have to like lamb. 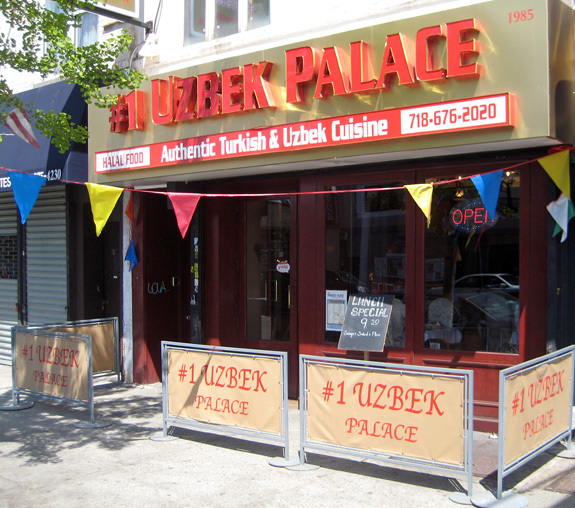 #1 Uzbek Palace delivers unsurprising but freshly prepared, quality Uzbek dishes. Not considering the bland rice, nothing we tried was bad, and everything was much less greasy than some other places. Even the service was pretty good! I see several bad reviews on Yelp, some of them from the Groupon crowd. One might argue that people obsessed with cheap food deals hardly make educated food critics, no matter how many friends they have on social networks. It’s also possible that the restaurant doesn’t fare as well at busy times (during our lunchtime visit, we were pretty much the only patrons). Regardless, I would definitely go back. Enjoy the weekend!!! Great weather…Happy Summer!! Thanks, Eileen! 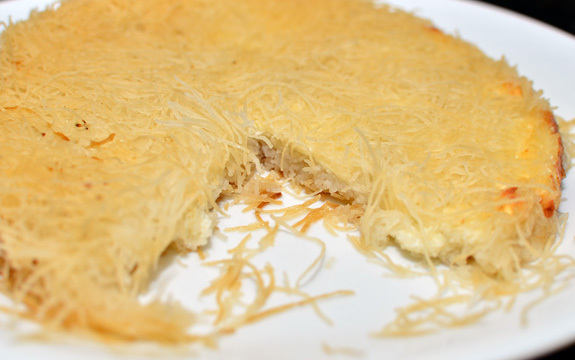 I’ll have to try Shirin Cafe (we just don’t drive south of New York very often). I see they have both Uzbek and Caucasian dishes.